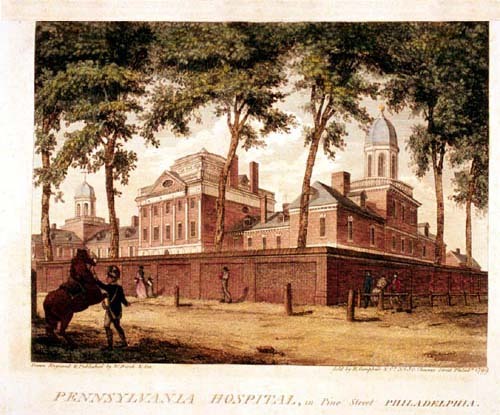 Pennsylvania Hospital, the nation's first hospital, was founded in l75l through the joint efforts of Dr. Thomas Bond and Benjamin Franklin, out of the need for a privately managed hospital "for the relief of the sick poor and for the reception and cure of lunaticks." The east wing was built about l755 from designs of Samuel Rhoads, member of the First Continental Congress, the west wing about l796, and the handsome central section 1794- 1805 from designs of David Evans, Jr. The first patients were admitted in 1756. Men were on the first floor, women on the second and "lunaticks" in special cells in the basement that were clean, dry and well ventilated. 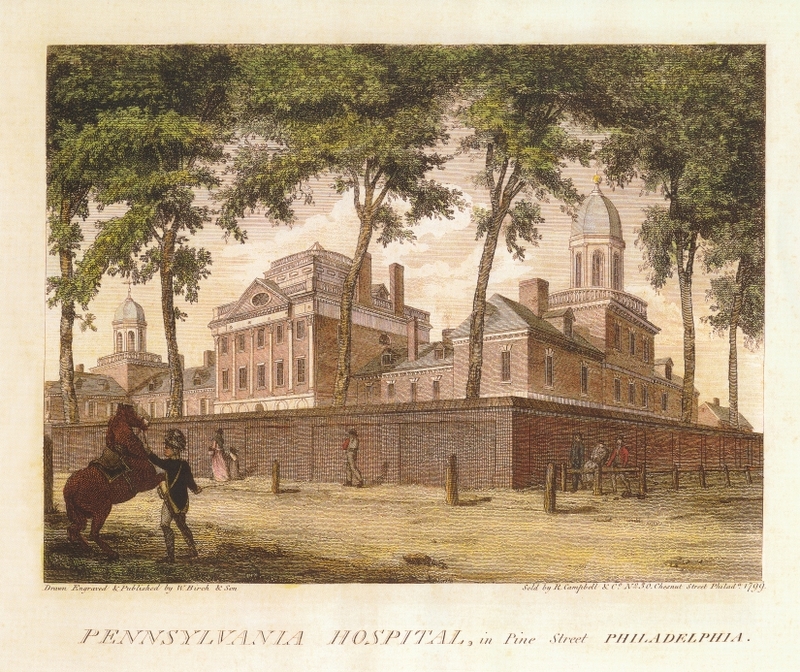 Among the prominent physicians who served the hospital during the 18th century were William Shippen and John Morgan, founders of the first medical school in 1765, which later became part of the University of Pennsylvania; Philip Syng Physick the "father of American surgery," who devised a flexible catheter, used absorbable cat gut for suturing, and removed cataracts; also Benjamin Rush, who recognized insanity as a disease, introduced hydrotherapy and occupational therapy and gave heroic attendance during the yellow fever epidemic (1793). He was the first American physician to receive international fame. From its beginning Pennsylvania Hospital was a leader in the treatment of mental diseases. It established the country's first out-patient care and its first clinical amphitheater. During the initial twenty-five years of operation over half the 9,000 persons admitted were entirely cured. For a time Franklin was president of the Board of Managers. He left the hospital his uncollected debts. For economic reasons, mainly caused by reduced revenues from insurance providers, hospitals today are consolidating. 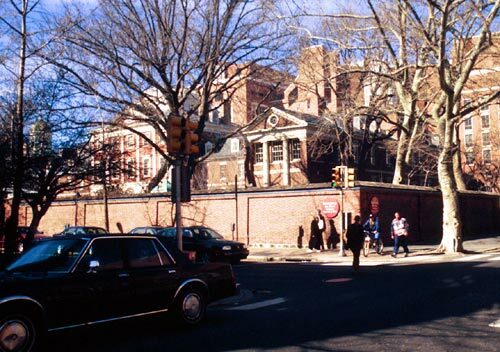 In 1997, Pennsylvania Hospital merged with the University of Pennsylvania Health System, bringing together the nation's first hospital and its first medical school. The system is a force in making Philadelphia a leading center of medical services, education and research. For almost two centuries the Pine Street facades have remained unchanged with the exception of porches that were added to the southern end of the east and west wings during the 20th century. 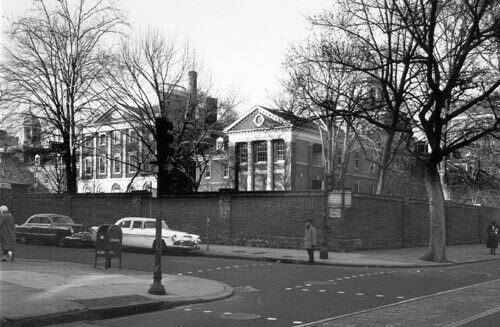 Since 1960 three new buildings facing Spruce Street have been constructed (BG 2000).